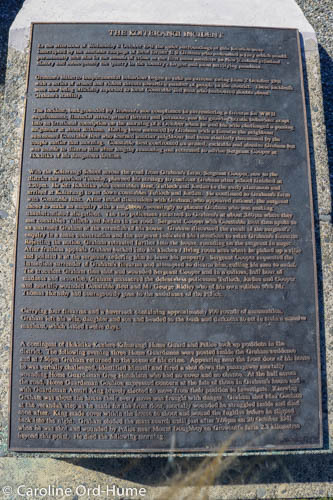 The purpose of the Hokitika Koiterangi Incident Memorial is to honour the memory of the seven victims murdered by mass murderer Eric Stanley George Graham. The murders took place in what is now commonly known as Kowhitirangi on the West Coast in New Zealand in 1941. The Memorial, created using a boulder from Diedrichs Creek nearby and designed by Barry Thomson of Glenavy, was unveiled in 2004 on 8th October. Each victim is named on the memorial with a commemorative bronze plaque as follows; Sergeant William Cooper, Constable Ted Best, Constable Percy Tulloch, Constable Fred Jordan, George Ridley, Gregory Hutchison, and Richard Coulson. This window presents a view from the gate down the pathway, 25 metres distant from the house and environs where the victims of this incident were slain. “Let me look into the face of death with unblinking eyes and with no sense of fear. Teach me to realise that there are prowling human wolves ever ready to devour the innocent, that there are depraved creatures cast in comely human mould to whom murder is but an incident”. In the afternoon of Wednesday 8 October 1941 the quiet surroundings at this location were interrupted by the unstable rampage of local farmer E S Graham who unleashed a fury which would permanently etch him in the annals of crime as the first mass murderer in New Zealand criminal history and subsequently the quarry in the country’s largest and most terrifying manhunt. Graham’s hitherto temperamental behaviour began to take an extreme swing from 2 October 1941 with a series of armed and violent threats towards a number of people in the district. These incidents were now being officially reported to local Constable Ted Best who harboured doubts about Graham’s stability. The incident, backgrounded by Graham’s non compliance in surrendering a firearm for WWII requirements, financial stress, armed threats and paranoia, saw his growing erratic behaviour erupt into an irrational conniption on the morning of 8 October when he and his wife challenged a passing neighbour at about 10.00am. Having been menaced by Graham with a firearm the neighbour summoned Constable Best who learned another neighbour had been similarly threatened by the couple earlier that morning. Constable Best confronted an armed, excitable and abusive Graham but was unable to disarm him after lengthy reasoning and retreated to advise Sergeant Cooper at Hokitika of his dangerous decline. With the Koiterangi School across the road from Graham’s farm, Sergeant Cooper, new to the district the previous Tuesday, planned his strategy to confront Graham after school finished at 3.30pm. He left Hokitika with constables Best, Tulloch and Jordan in the early afternoon and arrived at Koiterangi to set down constables Tulloch and Jordan He continued to Graham’s farm with Constable Best. After initial discussions with Graham, who appeared rational, the sergeant chose to make an enquiry with a neighbour, seemingly to placate Graham who was making unsubstantiated allegations. The two policemen returned to Graham’s at about 3.40pm where they met constables Tulloch and Jordan in the road. Sergeant Cooper with Constable Best then spoke to an unarmed Graham at the verandah of his house. Graham discussed the result of the sergeant’s enquiry in a tense conversation and the sergeant indicated his intentions to seize Graham’s firearms. Rejecting the notion, Graham retreated further into the house, rounding on the sergeant in anger. After fruitless appeals Graham backed into his kitchen / living room area where he picked up a rifle and pointed it at the sergeant, ordering him to leave his property. Sergeant Cooper requested the immediate surrender of Graham’s firearms and attempted to disarm him, calling his men to assist. The truculent Graham then shot and wounded Sergeant Cooper and in a callous, half hour of madness and extortion, Graham massacred the defenceless policemen Tullock, Jordan and Cooper and mortally wounded Constable Best and Mr George Ridley who of his own volition with Mr Thomas Hornsby had courageously gone to the assistance of the Police. Carrying four firearms and a haversack containing approximately 700 rounds of ammunition, Graham left his wife, daughter and son and headed to the bush and darkness to set in train a massive manhunt, which lasted twelve days. A contingent of Hokitika-Kaniere-Koiterangi Home Guard and Police took up positions in the district. The following evening three Home Guardsmen were posted inside the Graham residence and at 7.50pm Graham returned to the scene of his crime. Appearing near the front door of his house he was verbally challenged, identified himself and fired a shot down the passageway mortally wounding Home Guardsman Greg Hutchison who had no cover and no chance. At the hall across the road, Home Guardsman Coulson expressed concern at the fate of those in Graham’s house and with Guardsman Amuri King bravely elected to move from their position to investigate. Knowing Graham was about the house their every move was fraught with danger. Graham shot Max Coulson at the verandah step as he made for the front door, mortally wounded he struggled inside and died soon after. King made cover within the house to shoot and wound the fugitive before he slipped back into the night. Graham eluded the mass search until just after 7.00pm on 20 October 1941 when he was shot and wounded by Police near Mount Doughboy on Growcott’s farm 2.3 kilometres beyond this point. He died the following morning. Kowhitirangi was once known as Koiterangi, as it is written in the memorial text. The Memorial is surrounded by flat dairy farming country with a backdrop of the Doughboy Mountain landmark and the Southern Alps in the distance. From Hokitika SH6, take Stafford Street heading east inland, and follow the signs heading towards Hokitika Gorge. 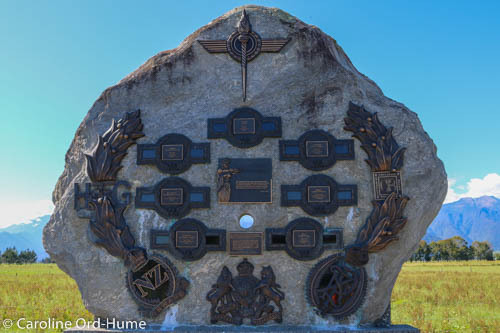 You will find the memorial on the side of Kaniere-Kowhitirangi Road approximately 14km from Hokitika. Hokitika Gorge Scenic Reserve is a bit further inland and is signposted. Things to do in and around Hokitika town, and accommodation in Hokitika.